Identity and Expression: What Does Gender Got to Do With It? As you’ve probably already heard, Caitlyn Jenner unveiled her true self to the world this week. And although it’s hard to know for sure if societal pressure to adhere to gender expectations was the main reason she kept her identity a secret for as long as she did, I know it doesn’t have to be this way. It seems ridiculously silly to zero in on the gender of a person and dismiss the impact of their individual personality, interests, dreams, and convictions on who they are as a whole. With how much research has been conducted on sexuality and gender flexibility over the years, mental health professionals can now effectively help gender-variant people accept themselves and live their lives as exactly who they are. 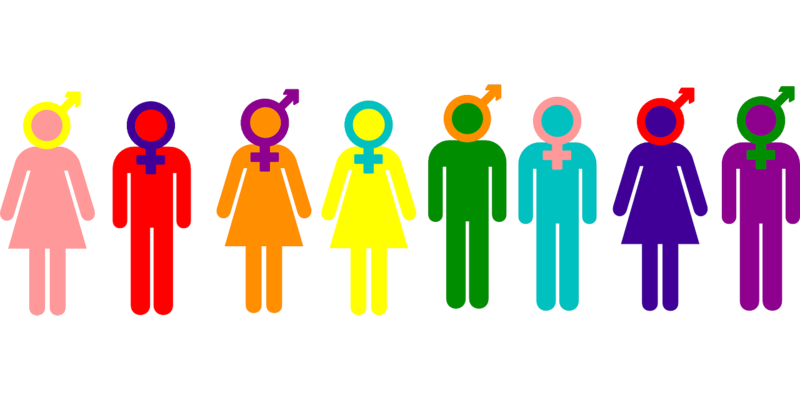 Concerns for which gender-variant people may seek counseling range from struggling with self acceptance to dealing with complex social and relational issues. Many of the therapists at Talkspace have extensive experience helping LGBTQ individuals overcome gender-identity and sexual orientation-related problems. Some can even speak from personal experience. Everyone professionally affiliated with Talkspace has a passion for helping all types of people achieve peak mental health and personal happiness. I, for one, have always had an interest in learning about gender norms, different sexual orientations, the fluidity of gender identity and expression, as well as how society influences our understanding of each. These were some of the questions I wanted to explore when I decided to major in sociology. As sociologists, we are trained to detect patterns that emerge within a culture or in a community, as well as explain why and how they came to be. Throughout college, I supported myself by working in a toy store, which strangely proved to be an incredibly eye-opening experience that taught me a lot about gender expectations and how they influence gender expression in young and adolescent children. The store was divided into different sections: plush toys, art supplies, educational games, various costumes, so on and so forth. As a budding sociologist, I made an observation pertaining to the specific shopping patterns the parents exhibited when they came in to purchase something for their kids. As there were many recurring customers, the experience of helping them pick out a product became an interesting sociological case study that spanned across 2 years. I noticed that when shopping for boys, a hefty percentage of parents gravitated toward shiny microscopes; amazingly creative construction sets; books about biology, space and technology; tool kits and medical supplies; cop and fireman gear; and other really cool things that are of interest to all kids, but mostly associated with boys. And it doesn’t take much mental effort to realize that these toys facilitate interests that can be beneficial in life personally, socially, or professionally. When shopping for girls, however, parents exhibited a very different pattern. Although there were plenty of young girls that showed enthusiastic interest in telescopes and magnets and remote-controlled gadgets, their parents would normally buy them something else – something they thought was more appropriate for girls. They were a lot less likely to buy toys like a talking atlas that teaches kids about each country, or an interactive encyclopedia that could be immeasurably educational. They were a lot more likely to purchase a tea set, princess outfits, art supplies or a dollhouse. Don’t get me wrong, I am not implying that letting girls play with dolls or boys play Cowboys and Indians is a bad thing. But I am stating that parents have to be mindful of how their actions and gender expectations can affect the gender identity and gender expression in their children. Research shows that the environment in which a person is raised plays a huge role in how their sexuality and identity are expressed. Whether or not a child grows up to be a well-adjusted human being is very much influenced by his or her parents. On a great day, an open-minded parent would come into the store and buy a tea set as well as a microscope for their child. I hope it’s because they want their kid to know how to make tea as well as excel in science, regardless of their gender. Previous Previous post: Can Superhero Therapy Treat Depression, Anxiety, and PTSD? Next Next post: Dear Therapist: What if Work Interferes With My Therapy?